This couple wanted a nice retirement home for their mountain property. They had lots of ideas for their mountain home, but did not have enough budget to afford them all, and the plans they showed me would not fit on their steep slope. 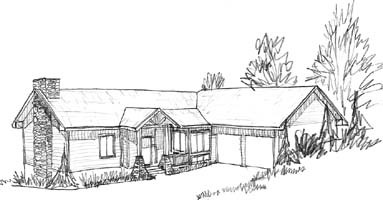 I set out to design the home to fit the slope by making the plan narrow and longer. This would have the added benefit of more rooms facing their beautiful view. I designed the garage with concrete walls to allow us to backfill earth against them. This would make the home even easier to fit on the steep slope. I also worked to reduce wasted square footage, and simplify the structure, to make their home less expensive to build. Because their property was at a high elevation, energy efficiency was also very important. To help reduce their budget, I moved the extra bedrooms downstairs. Sometimes my clients have difficulty with this idea because they cannot imagine having bedrooms in the "basement." But, if one side of the lower level is open, and the construction is done corectly, this can be the most comfortable area of the home. Because the home would be exposed to car headlights coming up the street, I placed the public areas of the home on that side, hiding the master suite in a more private area.